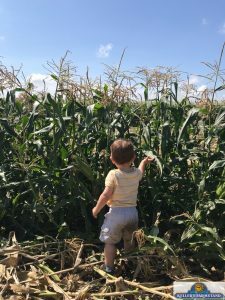 Farming 101: The height differences between sweet corn and field corn. 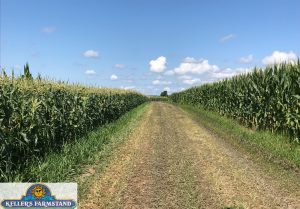 Sweet corn is on the left, and field corn is on the right. This future Keller farmer is 21 months old (pictured below). This helps you put the corn height differences in perspective. Both types of corn have reached their maximum height. Why so different? Sweet corn is shorter because it has a shorter growing season. It’s harvested when the ears have reached peak sweetness (around 3 months). 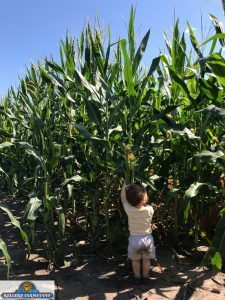 The plant is focusing on getting that ear of corn as sweet as possible, not focusing on unneeded height. Field corn is taller with a thicker stalk. It stays in the field longer because it’s harvested in the fall when the ears are nearly dried. The plant is focusing on a sturdy stalk to keep it all upright through a longer season. That ear isn’t sweet compared to an ear of sweet corn and it doesn’t need to be!